WoodrowAugustus - Brian Enos's Forums... Maku mozo! Yeah, a step up for sure. Especially with follow up shots. If money wasn’t a consideration I’d take a TSO over a RO every time. Thanks for the quick follow up on an old thread bump. That’s very helpful. I’m leaning towards the Romeo1 for now due to availability and lower profile. Thanks for the offer, but I’m more wondering about the need for milling the slide versus dovetail mounts. Do you find it hard to pick up the dot with it sitting that much higher than iron sight alignment? Any further updates about the durability on the Romeo 1? I’m looking to make a purchase and on the fence between that and the 2.5 DPP. I’d be curious to hear your comparisons as well. Huge CZ fan, but willing to consider the 92 platform. 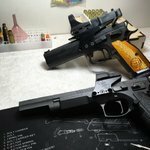 There’s a good thread about Primary Arms’ S2 slide machining work over on the CZ Firearms forum. Lots of pics that are helpful and more info. Looks great and thanks for sharing! That would make sense with Rowdy’s comment above yours. 5” or 6” Springfield 10mm? 6” barrel gives you a bit more room to burn powder and thus more velocity. That’s what I would do if it is gonna be a hog gun range toy. But also try to shoot each one before you decide, or at a minimum hold each one at the gun shop to get a feel for ergonomics. I bought a slicked up Shadow 2 and sold it because the SP01 frame feels better in my hands and I shoot them better.